Narrow Glenshire Drive before construction. Update: 7/17/2014. The Town of Truckee revised the start date to Wednesday, July 23 @ 9:00am. The second phase of the Glenshire Drive Bike Lane Project will begin Sunday, July 20 at 9:00pm. Glenshire Drive will be closed between Donner Pass Road and Olympic Boulevard from 9:00pm Sunday to Friday morning at 6:00am. The construction work involves drainage improvements and widening of the roadway up to 36 feet. The additional width will allow 5 foot wide bike lanes in both directions. Olympic Heights residents can access their neighborhood during the road closure via the emergency gate through Old Greenwood off the Overland Trail interchange from Hwy. 80. Glenshire/Devonshire residents should use the Hirschdale Road entrance from Hwy. 80. Phase one of the Glenshire Drive Bike Lane Project was completed last year. Cycling is much safer now on the widened roadway. 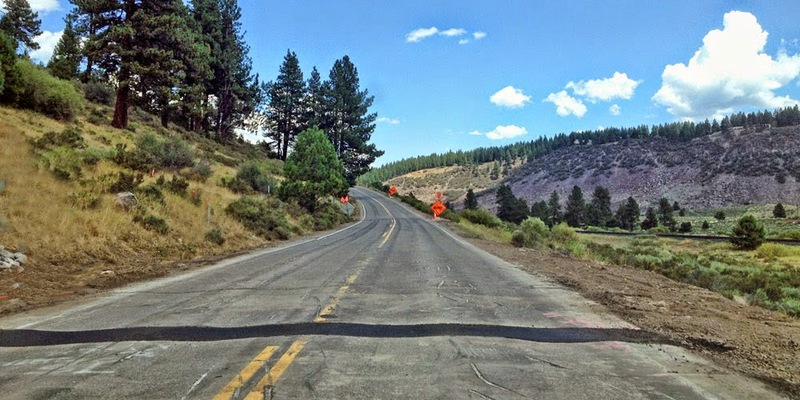 Cyclists will have painted bike lanes all the way out to Glenshire from Donner Pass Road. For any questions regarding the project contact Senior Engineer Todd Landry, 530-582-2904.